Asbestosis is caused by inhaling high levels of asbestos fibers. Prolonged accumulation of these fibers in your lungs can lead to scarring of lung tissue and diminished breathing capacity. Signs and symptoms of asbestosis usually don't appear until years after exposure. But once apparent, the condition often worsens and can lead to disability and even death if exposure to asbestos continues. The effects of long-term exposure to asbestos typically don't show up for 20 to 30 years after initial exposure. Signs and symptoms develop when damage and scarring caused by the asbestos fibers lead to stiffness in your lung tissue so that your lungs can't contract and expand normally (a form of pulmonary fibrosis). Asbestos is a natural mineral product that's resistant to heat and corrosion. It was used extensively in the past in the building and manufacturing industries. Some of its more common uses were in pipe and duct insulation, fire-retardant materials, brake and clutch linings, cement, and some vinyl floor tiles. People most likely to develop asbestosis are those who've been exposed to it for a long time. Most people with asbestosis acquired it on the job before the federal government began regulating the use of asbestos and asbestos products in the mid-1970s. Today, its handling is strictly regulated. Still, experts estimate that since the 1940s up to 10 million people may have been exposed to asbestos. The good news is that most people with a history of prolonged exposure don't develop asbestosis, and the risk of asbestosis diminishes every day away from exposure. These days, most instances of asbestos exposure occur during removal of old asbestos products or demolition of old buildings. If you live, work or study in a building where existing asbestos has been contained and sealed, you're not at risk of asbestosis and only at a remote risk of malignant mesothelioma, a rare cancer of the membranes lining the chest and abdominal cavities. Asbestosis has been linked to mesothelioma cancer. Asbestosis is a scarring of lung tissue caused by the inhalation of asbestos fibers. A portion of the fibers reach the alveoli (air sacs) where oxygen is transferred into the blood. Asbestos activates the lung's immune system and starts a reaction best described as an inflammatory process. Scavenger white blood cells (macrophages) try to break down the asbestos (phagocytosis) but are not successful, causing other cells (fibroblasts) to grow and form connective-tissue-based scars. The formation of scar tissue or collagen in the lungs is known as fibrosis. The scar tissue slowly builds up, often reducing the lung's ability to deliver oxygen to the blood and remove carbon dioxide (reduced diffusion capacity). The total lung capacity or TLC may also be reduced. In severe cases, the impairment of lung function can strain the heart, or even result in heart disease, such as right-sided heart failure or "cor pulmonale." Asbestosis has been linked to mesothelioma cancer. 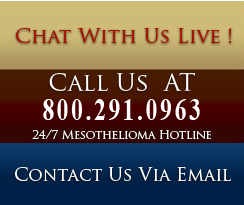 Mesothelioma cancer is a group of diseases related to asbestos exposure. The two most common diseases related to asbestos lung cancer are asbestosis and mesothelioma, with pleural mesothelioma being the most common form of mesothelioma. The inflammatory process starts within hours or days after inhalation of asbestos and injury at the cellular level begins shortly thereafter. In people who develop asbestosis, the inflammatory process continues to progress, fueled by indestructible asbestos fibers, even after exposure to asbestos ceases. This asbestosis inflammatory process may continue undetected for decades causing no pain or respiratory symptoms. In many people, the process eventually produces symptoms-breathing abnormalities and radiographic changes. Usually, the first symptoms are shortness of breath and a dry cough. These symptoms often precede abnormalities on chest x-ray or pulmonary function tests. The period between exposure and diagnosis is called "latency" and may range from 10 to 50 years. Asbestosis is a chronic inflammation of the lungs. The inflammation is a direct result of exposure to asbestos. Asbestosis is a progressive disease with no cure. The inflammation causes shortness of breath, which will get progressively worse as the disease progresses. Physicians can treat some of the symptoms of asbestosis with auxiliary oxygen, but it will not cure the disease. Death due to asbestosis occurs by respiratory failure.